LUSAKA, May 31 2016 (IPS) - Africa’s contribution to global malnutrition statistics is miserably high, with 58 million children under the age of five said to be too short for their age, while 13.9 million weigh too little for their height. 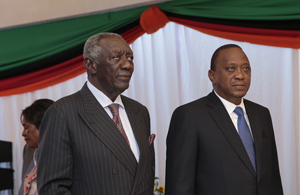 Former Ghanaian President John Kufor and Kenya’s President Uhuru Kenyatta. This is not only due to Africa’s food security deficit but also the lack of food diversity. While Africa is the only continent which fails to produce enough food to feed its own citizens, the continent’s nutrition lacks diversity. According to available statistics, Africa does not only spend $35 billion per year on food imports, despite having 65% of the world’s remaining arable land, but also accounts for 20 of the 24 countries with stunting rates of over 40%. “When the growth of our children is stunted today—the growth of our economies will be stunted tomorrow. But when Africa’s children are nourished and can grow, learn, and earn to their full potential, we will be able to unleash the potential of the entire continent,” said AfDB Group President, Akinwumi Adesina, during the launch of an initiative to increase investment in nutrition led by some key African leaders. New analysis from the Global Panel on Agriculture and Food Systems for Nutrition shows that increased investments to meet the World Health Assembly target of reducing stunting by 40 percent by 2025 could add $83 billion in additional GDP growth in just 15 sub-Saharan African countries. However, a new Africa-specific investment framework by the World Bank and Results for Development shows that to achieve the WHA stunting, wasting, anemia and breastfeeding targets, in sub-Saharan Africa, would require an increased investment of approximately $2.7 billion per year for 10 years. It would require investment of approximately $1.8 billion per year from donors and $750 million from African governments over the next decade. It is for this reason that Adesina and former Ghanaian President, John Kufor outlined their intent to create the African Leaders for Nutrition (ALN), which aims to bring together Heads of State, Finance Ministers, and leaders from key sectors across the continent to champion and increase investment in nutrition. 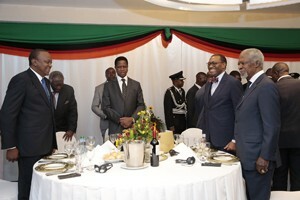 Host President Edgar Lungu, AfDB pressident Adesina, former UN Sec general Kofi Annan, former Ghanaian President John Kufor and Kenya’s Uhuru kenyatta. And Kofi Annan, Chair of the Kofi Annan Foundation, praised the effort while highlighting the role agriculture can play in defeating malnutrition. “I am delighted to see this effort take shape for greater leadership, partnership, and investment in nutrition security,” said Annan. “Malnutrition remains a major barrier to development in many African nations, but we have global consensus on what targets we need to reach, along with a roadmap for action. One of the most critical steps we can take to achieving nutrition security is to transform the continent’s agricultural sector, because it’s not just about the amount of food that we grow, it’s also about the type of food that we eat. We need agriculture to be nutrition-smart,” said Annan, highlighting his readiness to work with the African Leaders for Nutrition on creating agriculture and food production systems that are diverse, efficient and resilient. And in video message, Bill Gates, Co-Chair of the Bill & Melinda Gates Foundation, welcomed the formation of the ALN and its potential impact through increased nutrition investments. The event in Lusaka built on the Invest in Nutrition occasion held in Washington, D.C. during the World Bank Spring Meetings in April at which Gates joined Adesina and global development leaders to launch the first-ever investment framework for nutrition and lay out research from a new groundbreaking analysis that gives policymakers and advocates a roadmap for how the world can accelerate progress against malnutrition. The AfDB’s event in Lusaka also featured remarks from nutrition champions Jamie Cooper, Chair and President, Big Win Philanthropy and a representative from the Dangote Foundation, on the importance of public private partnerships. “To empower people out of poverty, we must first invest in the gray matter infrastructure that will truly fuel this progress—the minds of our children. Nutrition is not just a health and social development issue, nutrition is an investment that shapes economic growth for all African nations,” concluded Adesina, emphasizing the importance of nutrition to long term cognitive development of children whose responsibility it would be to lift Africa from poverty. Now wait for the pan-Africanist, the Mugabe fans, and the anti-fact junta to claim Africa failed to feed itself because of a concerted conspiracy by the west.